New adventures await your Sims on the sunny shores and beneath the glistening water of an island paradise! From exploring the tropical isles to creating a five-star resort experience, your Sims can decide to embark on an unforgettable journey or make themselves a new home in this new utopia. Nautical Sims can even take the helm of fully customizable houseboats and set sail between islands! If your Sims would rather be in the water than on it, they can snorkel and scuba dive their way through the ocean. Who knows, they might uncover sunken treasure or befriend a mermaid! With innovative features never before seen in The Sims PC franchise and a world of new possibilities on land and in sea, your Sims will reap the benefits of their own island paradise. Set sail for adventure. Be it by paddleboat or speedboat, your Sims can now leave port to discover new lands and explore like never before, from inter-island travel to discovering their own uncharted island. Landlubbers need not apply! Build and run a five-star resort. Create a family-friendly resort of waterslides and buffet tables, a romantic retreat dotted with minimalist cottages, or a singles resort featuring multiple pool bars where Sims can mingle and flirt. Choose and fine-tune your amenities, set your prices, and wait for the reviews—and Simoleons—to pour in. The higher your star rating, the more popular your resort will be! Life is a beach. See what surprises await under the sea as your Sims build their skills in snorkeling/scuba diving. Your Sims may find themselves on the shore of a new island or discover sunken or buried treasure. Boat sweet boat. Whether your Sims love the water or are just prone to wanderlust, a houseboat may be the perfect abode. Houseboats are fully customizable and can be moored at any open port, so if your Sims tire of the view, relocate to a new locale! New ways to build. New stilted foundations give your Sims the best of both worlds—a home that’s partially on the water and partially on land. Build a resort, create travelling houseboats, and customize your very own island paradise for your Sims! Requires Origin Client to activate. RAM: For XP: 1 GB RAM / Windows Vista and Windows 7: 1.5 GB RAM * For NVIDIA ION computers, the game requires at least 2 GB RAM. Video Card: 128 MB Video Card with support for Pixel Shader 2.0. Nvidia GeForce 6 series or better, and all NVidia G, GT, GTS, and GTX video cards. ATI Radeon™ series card 9500 series or better, and all ATI X, X1, and HD video cards; Intel® Graphics Media Accelerator (GMA): GMA 3-Series, GMA 4-Series Please note that the GeForce 6100 and 7100 cards are not supported. Additional Info: Requires installation of Origin for gameplay. Laptop versions of chipsets above may work, but may run comparatively slower. A whole new world for your Sims to explore! 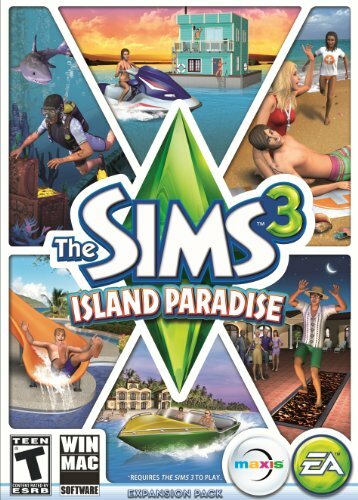 The Sims 3 Island Paradise is an incredible expansion pack, filled with a so many new things for your Sims to do and explore. The new town, Isla Paradiso is actually a group of islands in the ocean, each one with different buildings and homes on it. Instead of traveling everywhere by car, now you hop on a speed boat to get from island to island. The whole ocean is there for you to explore, and there’s stuff everywhere!Homes can now be built right on the water. Instead of driveways and garages, you now have docks and slots to park your boats (speed boats, row boats, sail boats, and more). Homes sit right on the beautiful blue ocean water, with fish and huge sharks swimming right around them. Your sim can fish and skip stones right off the dock, or jump in and do a bit of swimming or snorkeling for seashells and gems.When your ready to venture out even farther, head out to one of the marked scuba diving locations for an adventure under the waters surface. Your sim needs to have spent some time working on their snorkeling skills first, before they will be allowed to take an underwater trip. When they’re ready, they will switch into their scuba gear and dive down quite a ways, checking out all the fish and plant life that dwells on the ocean floor. Each dive location is completely different from the others, some having more things to explore than other. While under water you can catch fish, open treasure chests, explore caves (in the same way your sim can explore the catacombs in the graveyards) and even meet and socialize with other sims underwater. You never know who you will run into while swimming or scuba diving. Regular people, ghosts and even mermaids all are around and exploring the dive locations.You’ll find everything from money to pieces of maps in the treasure chests. Gems, shells and other items can also be found while your searching underwater. But you’ll need to be wary of sitting in one spot too long. Linger around, floating in the same location for a while, and one of the large sharks swimming by may try and make a meal of you. Even if they don’t attack, you may find just the sight of one of them makes your sim have an accident in their wetsuit!When you’re ready to spend some time on land, there’s resorts you can kick back and relax at. Make sand castles on the beach, take in the view from one of the new balconies in the build menu, or for a shark-free swim, play on some of the new slides and waterfalls at the resort pools. Lifeguards patrol the beaches, and you can even take a job as one, with it being a new sim career choice.For those wanting to build their own homes and resorts, there lots of new things in the build and buy menus. Tables and chairs, new lighting options, bright tropical decor, fountains, new plants, trees, flower and rocks, hot tubs, fire pits, a few walk for your sims to walk across, and so much more. There’s a new All-In-One-Bathroom that is about the size of a shower for your sims to use on their houseboats, where space in minimal. They go in and all “bathroom needs” are filled at the same time. Your sim can even buy a wind-surf board or a “Aqua Sled” jet-ski to play around on out in the water.There are a several new pieces of clothing added for sims to wear, including some new swimsuit options (finally!) and lots of warm weather clothing, like shorts, dresses and tank tops. There are also a few new hair styles added. New sim traits and lifetime wishes have also been added to the game.But the focus in this expansion pack is definitely the water fun, both on the surface and under water. Everything is about life on or in the ocean. Much like the Sims 3 World Adventures pack focused a lot on exploring hidden tombs and such, this pack is all about exploring the sea. It’s almost like an Island Paradise version of World Adventures. There is so much in this pack to do and explore, it’s definitely one of the best Sims expansion packs made to date! FINALLY- a GREAT Sims 3 Expansion Pack! I have been various levels of disappointed in every Sims 3 expansion and stuff pack that has come out. They all have bugs, and there is never enough content to feel like you really got your money’s worth.The only bug I have gotten after playing almost a full day is my sim occasionally popping out of a cave onto the nearest island for no apparent reason.Now for the good stuff:There’s more *stuff* in this EP than EA usually gives us. The stuff looks nice, and I had fun designing my home and resort. I have not spent much time looking in depth at clothing or hair, but the ones I have seen on townies have looked pretty decent.The snorkeling is okay, but the scuba diving is awesome! You meet other sims down there, and a mermaid or two. Sharks are not as scary as you think. I have gotten away fairly quickly, but none have tried to bite me yet. I even “watched” one for a few minutes.The uncharted islands are fun to discover. You can swim up to a couple of them, but most seem to require maps assembled from messages in bottles. There are rare chests with map fragments and gems, too. When you discover one, it is yours. You can move there or build a resort, and you can have more than one home in your town.At first glance, the town looks like a mess. You have to take taxi boats from one part to the next, and there are trails just like World Adventures. Once you spend a little time going from place to place, it’s not so bad.If it is possible to create a dive location yourself, I have not figured it out. I would like to be able to add scuba spots to other towns, or to have more land available for things like nightclubs and venues. One thing this game seems to be sorely lacking is an all-in-one town. They’ve done a good job of incorporating most of the EP venues into Sunset Valley, but I can’t see any evidence of that this time around. I think they just expect you to move your families to the island, have a little fun, and then move back home.Overall, MUCH better than the other EPs have been. I’ve been a big fan of the Sims franchise for awhile and Island Paradise was no exception to that. There are a ton of new actions, and honestly as a Florida girl in real life, it’s pretty cool to have my Sim be able to do a lot of the stuff I do in reality as far as water is concerned.I did have a fairly substantial problem with lag when I first played but I spoke with someone from EA and they completely fixed it. ^_^ I’m very happy with the service I received and the quality of the game itself. Don’t hesitate to buy if you’re as big a fan of the Sims games as I am!